Squid may provide an eco-friendly alternative to plastics. Washington: A recently discovered protein, found in squids, could revolutionise materials in a way that would be unattainable with conventional plastic. The study was published in Frontiers in Chemistry. Originating in the ringed teeth of a squid's predatory arms, this protein can be processed into fibres and films with applications ranging from 'smart' clothes for health monitoring, to self-healing recyclable fabrics that reduce micro-plastic pollution. Materials made from this protein are eco-friendly and biodegradable, with sustainable large-scale production achieved using laboratory culture methods. 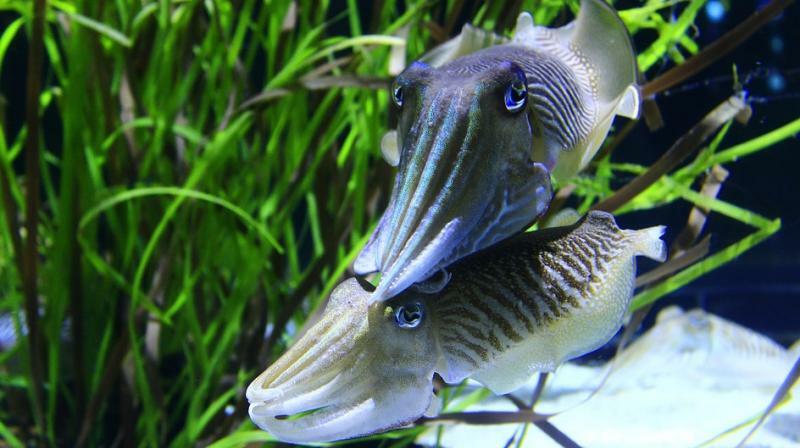 "Squid proteins can be used to produce next generation materials for an array of fields including energy and biomedicine, as well as the security and defence sector," says lead author Melik Demirel, adding, "We reviewed the current knowledge on squid ring teeth-based materials, which are an excellent alternative to plastics because they are eco-friendly and environmentally sustainable." "Nature produces a variety of smart materials capable of environmental sensing, self-healing and exceptional mechanical function. These materials, or biopolymers, have unique physical properties that are not readily found in synthetic polymers like plastic. Importantly, biopolymers are sustainable and can be engineered to enhance their physical properties," explains Demirel. The oceans, which have borne the brunt of plastic pollution, are at the centre of the search for sustainable alternatives. A newly-discovered protein from squid ring teeth (SRT) - circular predatory appendages located on the suction cups of squid, used to strongly grasp prey, has gained interest because of its remarkable properties and sustainable production. The elasticity, flexibility and strength of SRT-based materials, as well as their self-healing, optical, and thermal and electrical conducting properties, can be explained by the variety of molecular arrangements they can adopt. SRT proteins are composed of building blocks arranged in such a way that micro-phase separation occurs. This is a similar situation to oil and water but on a much smaller, nano-scale. The blocks cannot separate completely to produce two distinct layers, so instead molecular-level shapes are created, such as repeating cylindrical blocks, disordered tangles or ordered layers. The shapes formed dictate the property of the material and scientists have experimented with these to produce SRT-based products for a variety of uses. In the textiles industry, SRT protein could address one of the main sources of micro-plastic pollution by providing an abrasion resistant coating that reduces micro-fibre erosion in washing machines. Similarly, a self-healing SRT protein coating could increase the longevity and safety of damage prone biochemical implants, as well as garments tailored for protection against chemical and biological warfare agents. It is hoped that the SRT-based prototypes will soon become available more widely, but more development is needed.